A former accountant and Bradford city councillor who defrauded his clients of more than £90,000 in a tax scam has been jailed for two years. Robert Payne, 34, who represented Keighley West on the council from 2008 to 2011, was also disqualified from being a company director for six years. 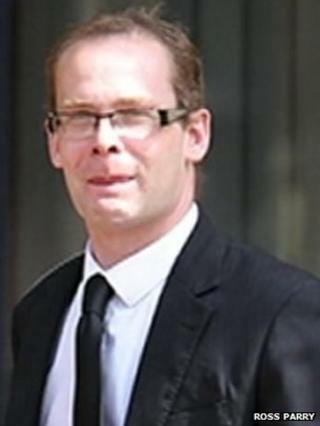 He set himself up as an accountant in 2001 despite having no qualifications, Bradford Crown Court heard. Payne had pleaded guilty in November to three counts of tax fraud. The court heard he had dishonestly claimed almost £140,000, but was actually paid £91,243. Payne manipulated his clients' accounts, faking documents to reclaim VAT and income tax payments, which he then kept for himself, a spokesman for HM Revenue and Customs (HMRC) said. He also set up a variety of companies in his own name to facilitate his fraud. Jo Tyler, HMRC's assistant director of criminal investigation, said: "Robert Payne has held positions of trust in the Bradford community, including that of a local councillor. "He quite clearly knows the difference between right and wrong and committed this fraud purely for personal gain." In December 2011 Payne, who represented Keighley West for the Conservatives and as an independent on Bradford council from 2008 to 2011, was jailed for five months for animal cruelty. He had killed four kittens by swinging them around and smashing their heads against a wall at his house.